ProVent has served several large pharmaceutical companies in recent years. Issues with their current cartridge dust collection systems include loss of airflow, downtime for replacing filters and cleaning the equipment. All of this goes away with the installation of a Uni-Wash Wet Dust Collector. By utilizing a Uni-Wash Wet Dust Collector, airflow is never restricted. Water is used as the filtration device in a violent scrub action. Specifically, the Uni-Wash orfice / impingement design creates this scrub through a scrub cone with a wide opening that cannot clog. Water is continually mixed with dirty air trapping particulate and either creating a solution or settling it to the bottom of the water tank. By using water as the filtration medium, there is no downtime for filter replacement or costs incurred. Occasionally, the dust laden water needs to be drained and the water tank re-filled. Most pharmaceutical processes require a through cleaning routine to prevent the growth of bacteria. 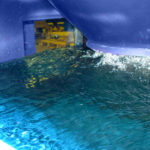 ProVent offers a unique spray down system incorporated within the equipment to aid in this process. By simply connecting a pressurized water source to the cleaning inlet, water is sprayed throughout the internals of the equipment. The Uni-Wash scrub never clogs and never restricts airflow. Containing a process within a booth prevents contaminated air from mixing with ambient facility air. 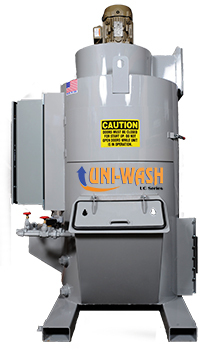 This custom Uni-Wash UC 30,000 CFM Wet Dust Collector exemplifies our commitment to working closely with our customers to meet their expectations. The design was modified to locate the dust collector in the second story of the facility with a complicated duct structure.